Why does it need a needle on the end? That needle is perfect for holding an olive/lime wedge/cherry etc!! 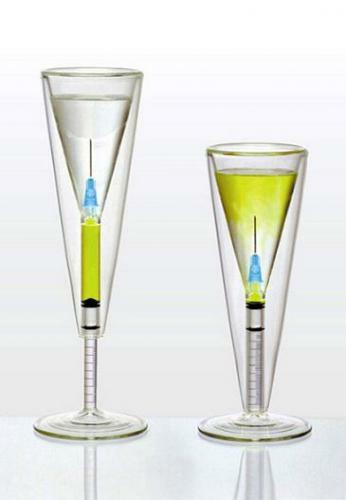 Yes, good for alcohol, but make it opaque, make the needle less prominent, inject some tasteless/colorless posion and you’ve got yourself a very effect killing cocktail. grip from base of cup as you set it down a little too hard,unnoticeable,except maybe by bond. That needle is perfect for inflicting multiple accidental stab wounds and injecting harmful liquid directly into my finger. Mmm, HIV shots. Rounds anyone?